In conjunction with HINGED: A Journal of Converging Arts, Poetry International is pleased to present an interview with Matthew Zapruder, conducted by editors Carly Miller, Katie Fagan, and Jen Marshall Lagedrost. 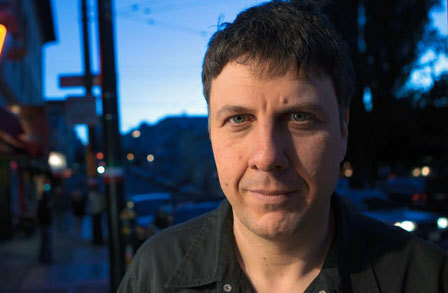 Matthew Zapruder is the author of several collections of poetry, including Come On All You Ghosts (2010), which was selected by Publisher’s Weekly as one of the Top 5 Poetry Books and a Booklist Editors’ Choice for 2010,The Pajamaist (2006), which was selected by Tony Hoagland as the winner of the William Carlos Williams Prize from the Poetry Society of America, and American Linden which was selected as the winner of the 2002 Tupelo Press Editors’ Prize. Sun Bear is the title of his forthcoming collection from Copper Canyon Press. His work has appeared in Poetry International, The New Yorker, The Paris Review, Harvard Review, The Believer, and Best American Poetry 2008. Both a Lannan Literary and Guggenheim Fellow, Zapruder now resides in San Francisco, where he is an editor (and co-founder) of Wave Books. What is a day in the life of Matthew Zapruder? Not that much different from any other self-employed person with several jobs, except for the fact that on good days I pick a few hours out of the day, shut off all communication devices and go into the reading and writing of poetry, a.k.a. that odd destabilized place of uncertain results. How do you balance your work as an editor for Wave Books with your own work as a poet? Being an editor is one of several jobs I have. I make the time to write within all those other responsibilities. The good thing about editing, like teaching, is that the things I am thinking about usually help me clarify my approaches in my own writing. Tell us about Wave Books’ choice to use fonts instead of images for book covers? It’s the culmination of a move away from representational imagery that began when Verse became Wave in the mid 2000’s. We want the language of our poets to be the most important driving force for all aspects of the book, including design. So designing the book out of the language choices of the poets seemed to be the best thing to do. Many of the poems in Come On All You Ghosts take on a childlike, ghostly voice that often rides his blue bicycle through thoughts and loss alike. How did this voice develop? I really have no idea. Through living and reading and trying to stay open to all the different feelings and expressions of feelings in poetry that are possible. It’s interesting that it seems childlike to you, I suppose that makes sense, since so many of our basic emotional experiences are formed through our experiences as children. How do you see poems as a space where the living and presumably dead can interact? Well, for one thing you can remember the presence of people who are gone in poems, and talk with them and in a sense be with them again, and therefore be dangerously close to their true actual absence. I also think for me the most important poets are dead. I love the work of my peers and teachers, and those poems are very present to me and influential. But in the moment of writing I find myself going back to poets who died, some recently, some a long time ago: Keats, Dickinson, Coleridge, Whitman, Stevens, Ritsos, Popa, Pessoa, Lorca, Desnos, Bishop, Berryman, Wieners, others. I read their poems in the silence of my room and ask for help from them in writing useful poems for the living. So in that sense they are probably very present in my poems, or at least I hope so. In what way do you think pop culture can be used to render poetry that is both current and timeless? I think what surrounds me belongs in poetry. People have always read books and listened to music and looked at what is around them, and hopefully will for a long time to come, so my experience of doing that in my time is not that different from Frank O’Hara going to see a movie. Or for that matter Keats going to see the painting “Death on a Pale Horse,” which he talks about in his famous “Negative Capability” letter. I don’t know about the artwork of Benjamin West, but I know what it’s like to go look at a painting. The book’s title poem arrives in the long sequence that comprises part IV of Ghosts, like a final and triumphant howl. How did this poem come to be? What was the deciding factor in placing it at the end of the book? In fall 2008 I was going back and forth between Houston, where I was teaching, and San Francisco, where I had just moved to be with my girlfriend at the time, now my wife. After several months of this I was basically half-hallucinating all the time, never exactly sure where I was. Plus there were two giant hurricanes that had completely disrupted everything, I had slept for almost two weeks in the kitchen of the house where I was living in Houston because we didn’t have power and it was too hot to sleep in the upstairs bedroom. The pool at that house was filled with branches and a weird scum, all the buildings in downtown had their windows blown out, and the city was stunned. It seemed like the end of the world. I wasn’t even sure if what I was seeing was real anymore: one time I saw Flavor Flav in the Houston airport with a clock around his neck; a different time I walked through the first class cabin and Santana was sitting there, trademark bandanna around his head, reading a novel. I’m pretty sure those things actually happened. I had asked my workshop class to try to write a long poem, and had in the back of my mind started to think about doing so too. Towards the end of my time in Houston I had started hearing the phrase that became the title of that poem and of my book in my head periodically, like someone was singing or saying it. At first I thought it might be a song lyric I had heard, or maybe a line from a poem, so I looked it up on the internet, but nothing. On one of my last plane trips back from Houston to San Francisco a strange thing happened, never before or since: I suddenly knew that I would write a long poem in tercets and sections, and knew exactly how it would begin, how it would move, and so on. I started writing it in the taxi on the way home and basically wrote the whole poem in a few days in San Francisco. All the experiences I had been having, all the failed poems and failed moments in poems, seemed available to me in the writing of the poem. I was so exhausted and present that I just poured everything into the poem. I knew I had finished the book I had been writing, and that the poem would go at the end of the book and provide the title. I don’t know how I knew all these things, I just did. It doesn’t usually work like that. How did the poems in your forthcoming book Sun Bear come together, and how does it differ from your creative process in producing Ghosts? Things usually work the same way. I write the best poems I can for a few years, using whatever techniques I can summon, from writing exercises to just sitting and staring at a blank piece of paper until something happens. Then at some point after a few years I take a look at the pile of poems and very strictly put aside anything I think isn’t up to the highest standards, and see what I have. If there is a book there it is done. If not, I keep working until it is. Many poems I have published and like very much just don’t end up making it into the book. In this way the book is a record of my most attentive poetic thoughts over the course of a sustained period of time. From the first book I wrote, I always had the attitude that I never wanted to look back and think, I published a book just to do it. Nothing is worth that. I feel protected by my own sternness with myself: if I am criticized, or if people don’t like the book, I know I did my very best, and that is all I can ask of myself. What, outside of poetry, is your genre crush? I listen to a lot of music. But I can play music, at least some, so maybe that’s not exactly like a crush. A crush needs more ineluctable distance. I think I’d most like to be able to draw, something physical, but really I can’t, at least not yet, so maybe that is my genre crush, drawing. How do you envision the future of poetry and converging arts? I think the noisier and more full of information masquerading as knowledge our world becomes, poetry reveals itself as more and more essential. Artists I respect greatly, painters and sculptors and composers and rock musicians and film makers, seem to be more drawn to poetry than ever, and poets to them, which makes sense. Artists need to band together against all the forces, and I think there is an implicit understanding among artists now, that the more desperate the times become, the more we need each other. So I think the future is promising for those connections, even if it is not so promising in so many other ways, though we can always hope, through our art at least. For more insight into Matthew Zapruder’s head, visit his blog! To buy Come On All You Ghosts, visit Copper Canyon Press!